By using the software CitySim Pro provided by kaemco LLC (“KAEMCO”) you are entering into a binding contract with our company. Your agreement with us includes these Terms and Conditions of Use (“TERMS”). If you do not agree with these TERMS, do not use the software. The software is provided "as is"; installation, maintenance, documentation and training services will be subject to retribution through additional requests to KAEMCO. You will not claim rights in any patents and/or trademarks on the software received from KAEMCO. KAEMCO will not be held responsible for any consequence of the use of the software. You will acknowledge the use of the software and the origin of the Solver at EPFL in all publications and presentations. CitySim Pro is free. However, import and export features need a login, which can be obtained by filling this form. 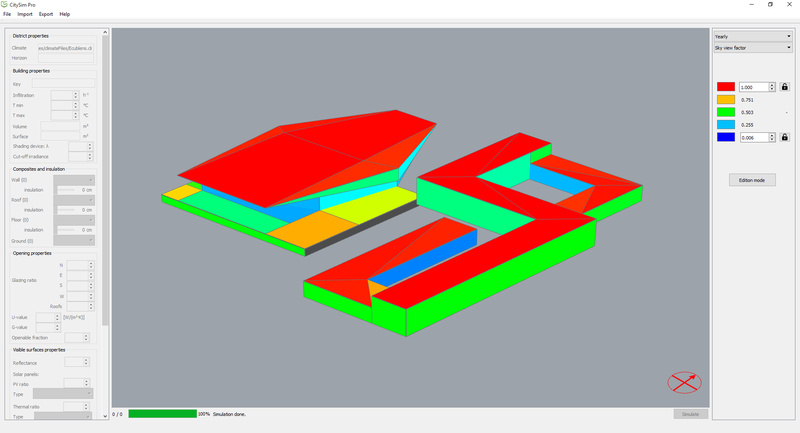 Built on top of the CitySim Solver, developed at the Solar Energy and Building Physics Laboratory of EPFL, CitySim Pro is a Graphical User Interface aiming at the simulation and optimisation of the sustainability of urban settlements. 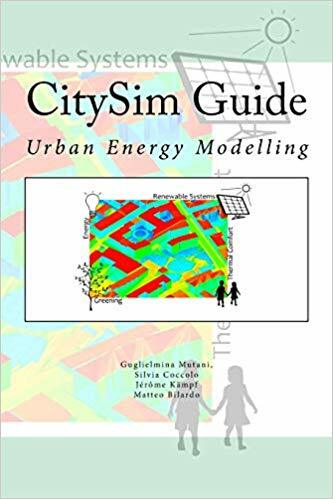 CitySim is fast (compared to other simulation engines), reliable (successfully tested against energy monitoring) and needs few input data (available at early design stages). Have a look at the publications list! How do I get the Climate and Horizon files? Climate and Horizon files can be produced using the software Meteonorm and saved respectively in CLI and HOR formats. For convenience, a few demonstration files are shipped with the software and stored in Resources/climateFiles subdirectory. How do I change the default construction materials? A database containing default construction materials is shipped with the software and stored in the XML file CitySimDatabase.xml in Resources/defaults subdirectory. When updating the software, please make sure that you have saved your own modified construction database. How do I import my own scene? 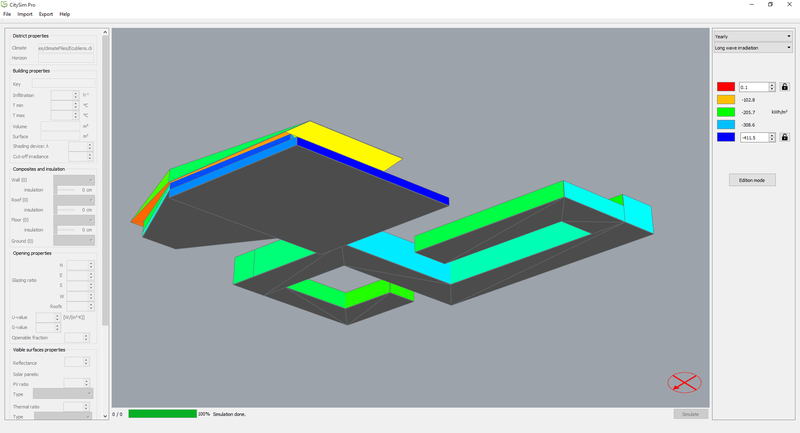 An AutoCAD DXF 2000 with 3DFACE or POLYLINE can be imported into CitySim Pro. POLYLINE is recommended as 3DFACE can only contain triangles or quads, and therefore your scene may be subdivided in more surfaces than really needed. The file has however to be prepared with care and organised using LAYERs. The name of the LAYER containing the ground has to start with GROUND, for shading surfaces with SURFACES. 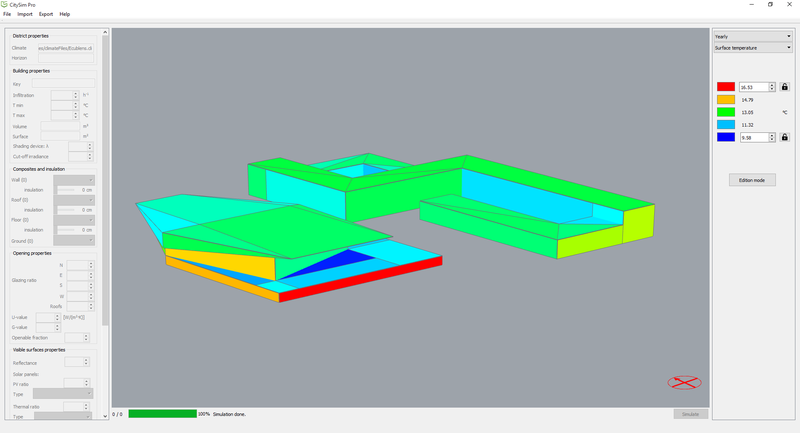 and finally each building need to be in separated layers. For more details, press F1 on the menu item within CitySim Pro. 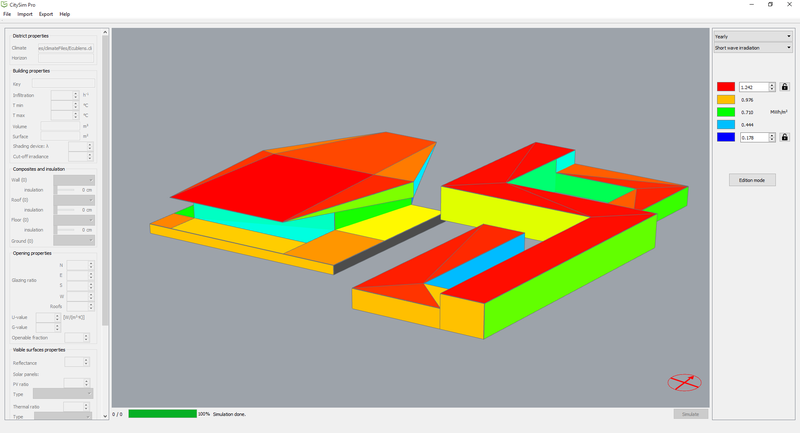 An example is provided with the software in the Resources subdirectory and named TwoHouses.dxf. How do I select a Building in the scene? 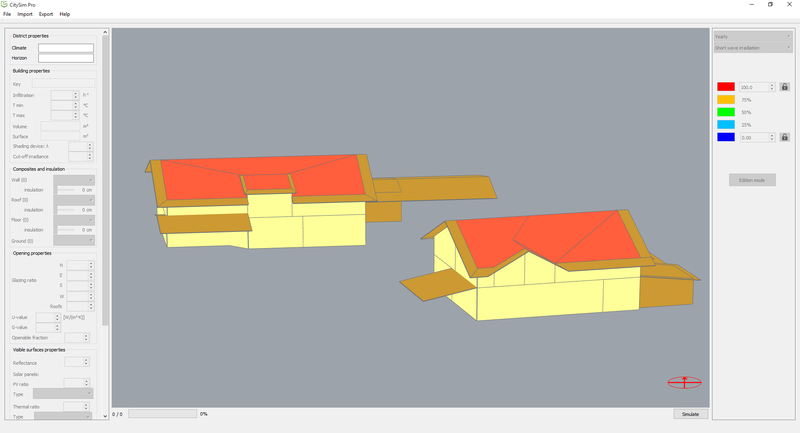 Using CTRL-click on any building surface will select the Building object as a whole. Once selected, the building propoerties can be edited. Using a simple click on a surface will allow to edit the Surface object's properties. Can I directly import my scene from Sketchup? Sure! 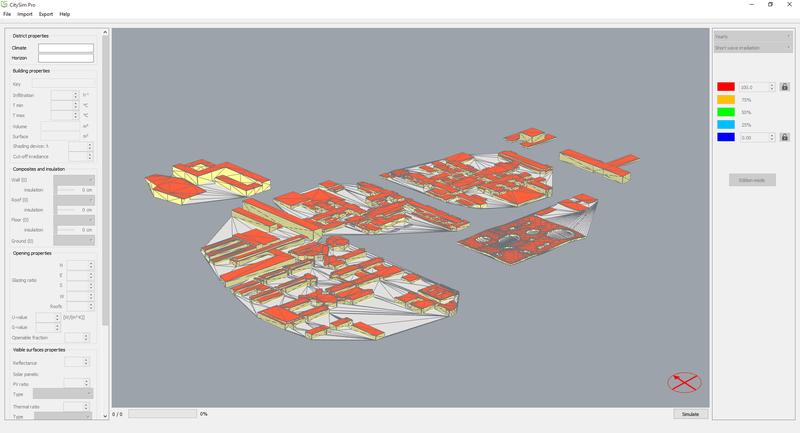 We provide with CitySim Pro an extension for Sketchup (a plugin in Ruby). Go to Sketchup preferences and add the extension, then you will have a new option in the File menu. Remember to create the layers according to the question How do I import my own scene? and everything will be just fine. Can I import my scene in CityGML? 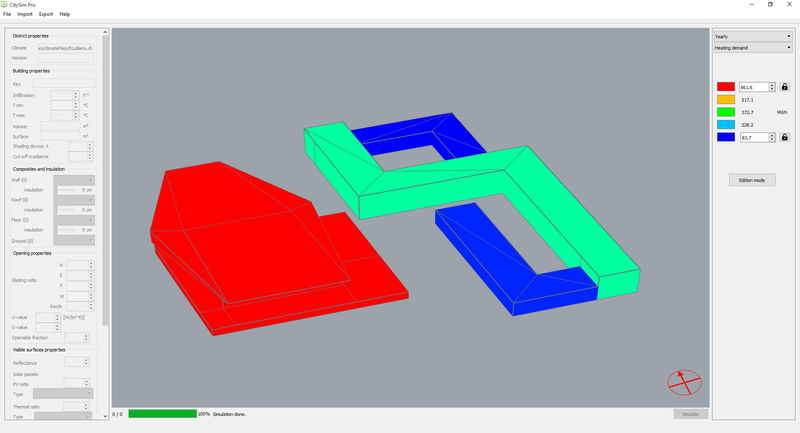 Yes, you can import CityGML models in LOD2. If you face some issue with your files, please don't hesitate to contact us. Can I export my scene in text format to analyse them with my favourite spreadsheet? SolarThermalProduction (J): the energy provided to the heat stock by solar thermal panels. If you face some doubts regarding the outputs, please consult the guide or don't hesitate to contact us.